Abstract: The Portwell EZDRV-300 fits into a 5.25" drive bay, and what makes it really unique is that is contains a CD-ROM, floppy drive and hard drive in just one bay! Every once in a while we stubble across a really useful product. 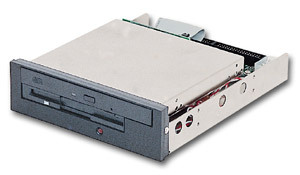 The Portwell EZDRV-300 fits into a 5.25" drive bay, and what makes it really unique is that is contains a CD-ROM, floppy drive and hard drive in just one bay! The unit manages to squeeze in all these things because it uses drives originally designed for notebooks - stack up an ultra-thin CD-ROM, FDD, and a 3.5" HDD and they are less than 40mm in height. Ultimately this set of drives is the perfect space saver for cases which have run out of free bays, for serves where expansion space is always limited, or for anyone faced with installing or testing lots of computers (like a IT person) that generally carries around a HDD, FDD and CDROM taped together to get the job done. Of course that last one won't apply to many of you, but in terms of space saving capabilities this is one very compact solution. It can give any server, or for that matter any case, some well deserved extra room for burners, zip drives, RAID drives, or whatever. Installing the drives is as simple as installing any other device into a 5.25" bay. The back of the unit has connectors for one IDE and FDD cable, and one Molex connector powers all three devices. If the 3.5" notebook hard drive is being used as the systems main drive, a lead wire can be connected to the motherboard to power a drive activity LED on the face of the unit. Both the CD-ROM and the Hard Drive connect up to the same IDE header, and a jumper can be set to switch between master and slave settings. Let's move on and see how the CD-ROM and HDD performed under Sandra.